Is there any limit on the number of heatmaps I can record? What is the difference between All Clicks and Latest Clicks? By default, when you open the heatmap tool in VWO, it displays visitor clicks on the static element elements of the page. However, your objective is to capture clicks on dynamic content (such as pop-ups, menu drop-downs, and so on) which are displayed on the page, based on certain actions the visitors perform on the page. Open the heatmap you want to view using the dashboard. To browse the website and perform all the actions as visitors would perform on the actual website, click Navigate on the Heatmaps tag. Perform the action required to generate dynamic elements. For example, click a button to trigger the pop-up page. When the dynamic content is available on the page, click the Heatmap tab on the report to turn off the the Navigate mode. To update the report, click Refresh. This action also plots the dynamic element on the page. VWO records only the first three clicks from a user in a particular session per page for generating a heatmap or clickmap report. For example, when a user lands on a test page, the first three taps or clicks by the user on the page are captured in a heatmap or clickmap report. By default, VWO records only first three clicks in a session per page. Our internal research shows that the first three clicks on a webpage are the most important clicks and have a huge impact on the reports. However, there are scenarios in which you implement multiple changes across different elements in a variation. These changes can even involve scrolling the page. In such scenarios, it is likely that capturing just three clicks might lead to missing important click data on elements you want to track. Using VWO, you can now increase the number of clicks to be tracked for each session. 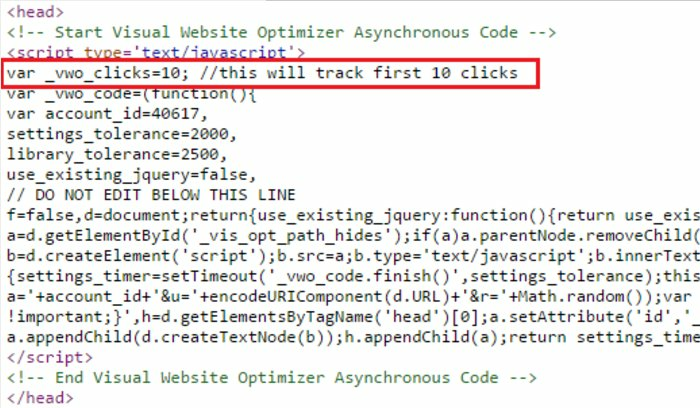 In the source code of the webpage where the VWO tracking code is placed, add the following code snippet at the beginning of the tracking code. If you wish to track first five clicks, then you can change the value of _vwo_click to 5. Save the changes. The number of clicks to be tracked for each session is now increased. For heatmaps created as part of a test, the maximum number of clicks that can be plotted on the heatmap report is 100k. However, there is no limit to the number of clicks plotted on standalone Heatmaps created under Analyze layer for visitor research. Latest Clicks shows latest 5,000 clicks on the URL, and All Clicks shows all the clicks on a page.